We promise to have you mad like the madrileÃ±os after your stay with us! Our central location, comfortable beds, and relaxing â€œcorralaâ€ atmosphere will make you never want to leave Madrid!Living Mad hostelâ€™s location is unbeatable. Weâ€™re a 5-minute walk from the bustling center of the city, Puerta del Sol and steps away from the world-famous Prado museum, refreshing Retiro Park, and Atocha rail station. 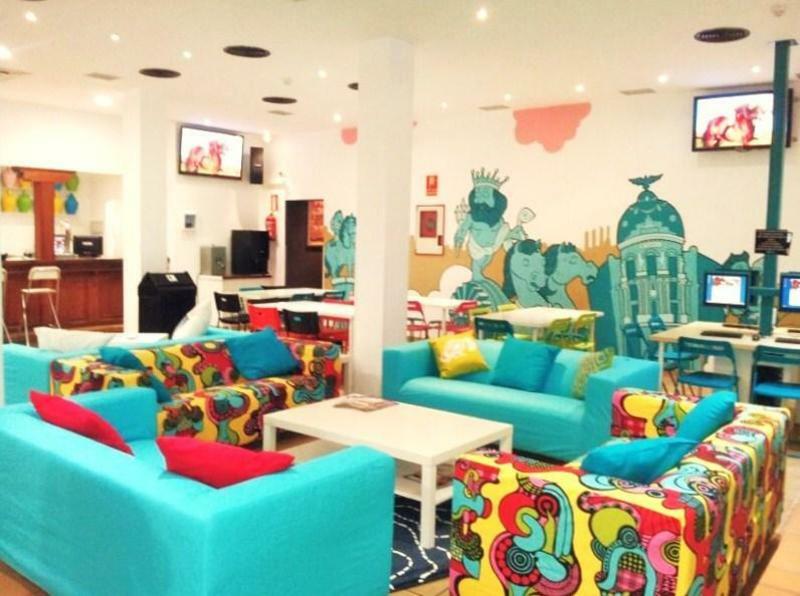 And when youâ€™re ready for a break in your adventures or a little siesta, chill out in our colorful common room, with walls lined with graffiti of the best sites in Madrid. Also, make your way up to our rooftop terrace; the perfect place to soak up the Spanish sun!Whether youâ€™re ready for a night out on the town or looking to explore more Spanish culture, Mad has activities for you every day and night of the week. Our pub crawls are top notch, the best way to party with your fellow travelers. We also offer tapa and shopping tours, and free Flamenco and Salsa dance classes. Thereâ€™s something for everyone! And if youâ€™re looking for more, our receptionists are available 24 hours to help you see the best of Madrid.We canâ€™t forget the basics. Our newly renovated rooms range from 2 to6 beds, each with clean sheets and secure lockers for each guest. Breakfast is included and available every morning with a variety of pastries and cereals. Wifi is free and there also computers available for guest use. On departure day we have secure luggage storage where bags can be left while you say goodbye to Madrid!After your fun and comfortable stay with us, youâ€™ll already be planning your next visit!! The nearest Metro stop is Anton Martin (Line 1, light-blue).Once you get out of the metro, take Calle de la Magdalena and follow it for about 100m. Take the second street to the left (Calle del Olivar) and then immediately take the first street to the right - this is our street, Calle de la Cabeza. About 50m down the street you'll find us on the left-hand side.From the airport:Take the metro pink line (Line 8) until the end of the line at Nuevos Ministerios. Change here to the dark blue line (Line 10) and take it to Tribunal. Change at Tribunal to the light blue line (Line 1) and go to Anton Martin. Then follow directions as above.Alternately, a taxi will cost about â‚¬30.From Atocha train station:Take the metro light blue line (Line 1) up to Anton Martin. Then follow directions as above.Alternately, a taxi it costs about â‚¬6.From Chamartin train station:Take metro Line 10 to Plaza Castilla, then change to the light blue line (Line 1) line and get off at Anton Martin. Then follow directions as above.Alternately, a taxi will cost about â‚¬15.For more information, please contact us after booking.